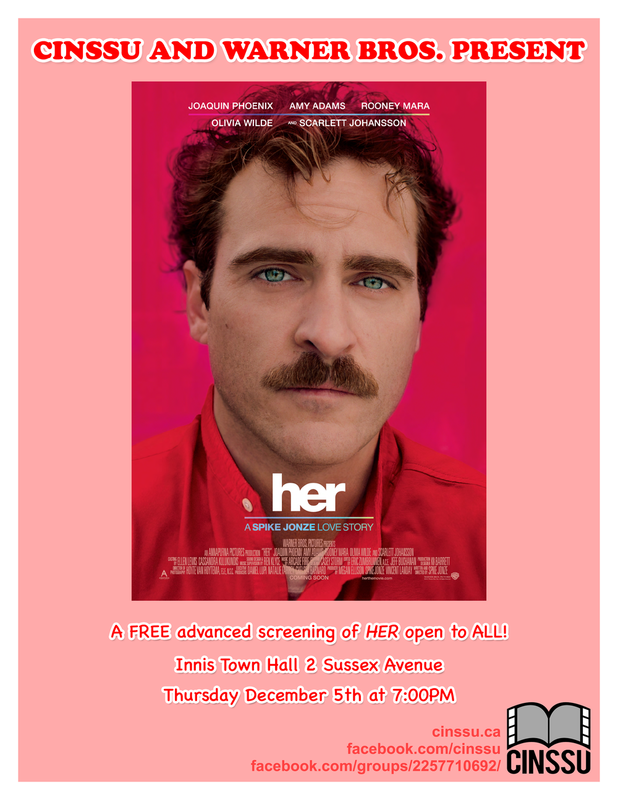 CINSSU and Warner Brothers are excited to bring you an advanced screening of their new Spike Jones Film : Her. Joaquin Phoenix stars as a lonely writer who develops an unlikely romance with an operating device that is designed to meet his every need. With an all star cast, including Scarlet Johansson, Amy Adams, Olivia Wilde and Rooney Mara, this film is a love story fit for the 21st century. Unfortunately we have run out of passes, but you can join our RUSH LINE: If you do not have a pass, please arrive EARLY. After we let ticket holders in, we will count how many empty seats there are, and let people from rush in. Seats are not guaranteed. For those who do have passes, remember to print them out! Come end the semester with CINSSU, WB and HER!